Nike's marketing pitch: Made light to go long. Upper: Single piece knit fabric, Flywire cord based lacing. Non-gusseted tongue. 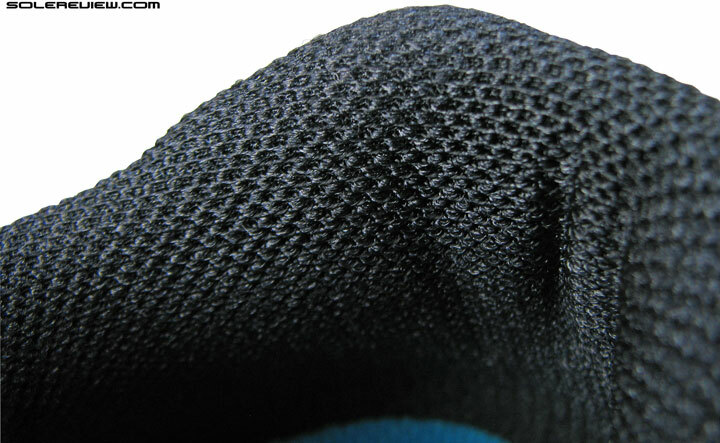 Midsole: Soft Lunarlon foam topped over a firmer EVA base. 10 mm heel to toe drop. 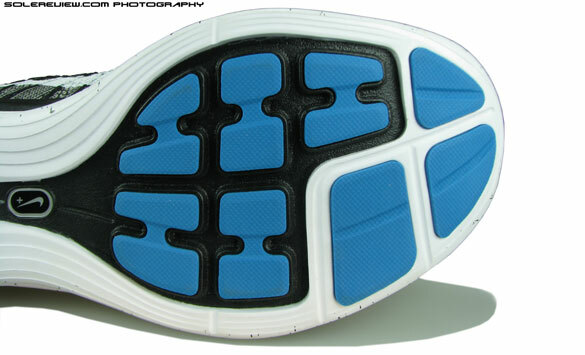 Outsole: Carbon rubber pieces under heel and forefoot. Widths available: Single - medium (reviewed). Wide fit available only as a Nike iD option. The 3rd generation Flyknit Lunar is here, and while it carries over the same midsole from 2014, the ride has changed - strange how things work. And the upper is way better this time around. The best Flyknit Lunar version till date. This one is pretty unique in design and fit, so can't think of clear alternatives. The Under Armour Speedform Gemini, to some extent. Lightweight, seamless and spacious upper fit, smooth transition and ride. The 2015 Flyknit Lunar 3 is the refined result of a progressive evolution. At times, running shoe evolution feels like computer OS upgrades. A brand new version gets released – a repository of powerful tech efforts, but comes with potential areas of can-do-better. Brand loyalists and tech geeks are likely to opt for immediate adoption, while conservative types might choose to camp it out. They wait for the ‘stable’ release, all bugs ironed out and the rough edges polished. Closer to perfection. At least that’s the idea. The Nike Flyknit Lunar’s progression suits that analogy well. 2013 saw the launch of the first model based off the Flyknit Lunar platform, yet packed niggles like excessive tongue slide. The second update arrived with noteworthy improvements, such as a sleeved tongue construction and a new, more responsive sole stack. But it had its Gremlins too, like the hard heel counter bearing down on the Achilles and pushing the foot further into the toe box. The most well-rounded version of the Flyknit Lunar so far. But this year is different. The Nike Flyknit Lunar 3 is here, and for the most part, exorcises unwanted ghosts of the past. This is the version which people will miss in 2016 if Nike decides to get heavy handed on the design in the name of innovation. If that happens, comment boards and forums will be replete with feedback like, ‘Nike should bring back the Flyknit Lunar 3’, or ‘I’m going to stock up on four pairs of the Flyknit Lunar 3’, or negative shouts like ‘Nike ruined it with the Flyknit Lunar 4’. Of course, this is purely a hypothetical and imagined scenario, and we have high hopes that none of this will ever come to pass. And that Nike will uphold the well proportioned standards of the Lunar 3 by pursuing an incremental evolution approach. Updating a well polished product such as this is best handled with kid gloves. So hopping back on the time machine into the present; what makes the new Flyknit Lunar 3 significantly better than before? Let’s start by saying that the newest model is more complete than it has ever been. In the process, it sheds a significant amount of slab. A lightweight reading of 249 gms/8.8 oz blips on the scale, compared to 272/9.6 of the Lunar 2 and 262/9.2 of the Flyknit Lunar 1. That’s nearly an ounce of reduction compared to last year, and for an under-10 oz shoe, that’s a quite few rungs up the ladder of improvement. But hang on a sec, if the new shoe and last year’s model share the same midsole and outsole, what’s behind the weight drop? For that, we’ll need to look towards the heel, which does much more than just reduce weight. See how the Achilles dip area has relaxed and moved backwards on the Lunar 3 (lower picture), compared to the pronounced forward curve of the Lunar 2 (top). If you recall (if you don’t, read our FKL 2 review), one of the things we highlighted on the Lunar 2 was its hard heel counter. The upper rearfoot used a full sized counter stiffener, one which caused the collar to close in tenaciously around the foot. The Achilles dip was curved aggressively inwards, and the side collar edges also made their somewhat intruding presence felt. The humongous heel counter of last year has been replaced by a more supple half-counter. No more of that. The full size cupping is replaced with a smaller (internal) heel counter, one which extends only till half-way up. Even the thickness of the internal molding feels thinner, and hence more pliable. This part swap seems the logical reason behind the Lunar 3 losing flab this spring. There are other probable causes like changes in upper design and tweaking of midsole densities over last year, but we don’t think they amount to much. Except on the Flyknit Lunar 1, which had a Nike+ cavity in its left midsole, a feature no longer part of the shoe for the past couple of years. That would be have upped the original Lunar’s weight by a few grams, and hence makes a like-to-like comparison unfair. The updated heel collar does more than just create a relaxed upper rearfoot; it does things to the forefoot fit as well. There much more open space in the front now, as the heel moves backwards. Besides helping shed bulk, the new heel molding achieves another important thing. With the backend no longer bearing down on the Achilles, the foot is allowed to be positioned a little rearwards compared to Flyknit Lunar 2. When that happens, the big toe distances itself from the front. The outcome, quite predictably, is more forefoot room, and a fit which is more relaxed than the Lunar 2. The midsole design is carried over exactly from the Lunar 2, no update. Nike Lunarlon foam glimpsed through the foam strobel’s lasting hole. Tails it is, so time to bring up the subject of the Lunar 3’s ride, then. The 2015 shoe carries over the same stack of foam layers which helped separate your foot from Terra firma on the Flyknit Lunar 2. So if nothing has changed in design, could the ride be any different? 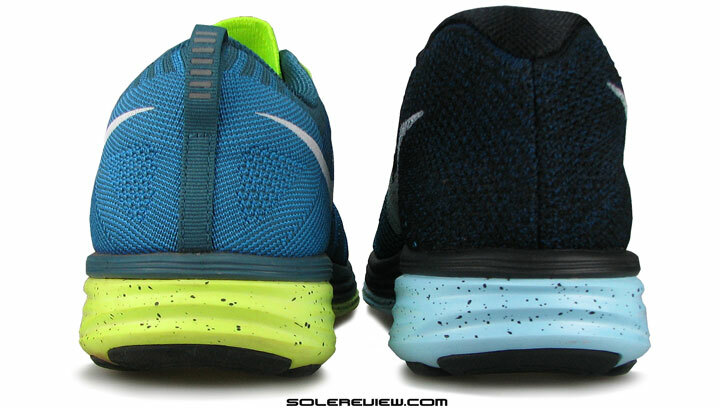 We’ll admit, it was a bit of a puzzle, trying to decode the ride difference between the two Flyknit Lunar versions. Because while the Flyknit Lunar 3 feels a little more firmer and slightly less responsive than the Lunar 2, the materials seem to suggest otherwise. Usually, things like these tend to be fairly uncomplicated to decipher. Like a firmer density of foam resulting in a firmer ride. Except that the Flyknit Lunar 3 doesn’t fall in line with that thinking. When it comes to actual midsole densities, the Flyknit Lunar 3’s firmer EVA base feels unchanged from where Lunar 3 left it at. The upper bedding, which happens to be Lunarlon foam, is softer than last year. So the outcome should be a predictably softer Lunar 3, correct? It might be so, but certainly doesn’t feel that way when running. The Lunar 2 felt more a mite more responsive and cushioned. That was puzzling, so we decided to give both the shoes a few more runs, and see what turned the situation thus. Unchanged design (except for top text) from 2014, but softer. Retains the open celled foam construction. 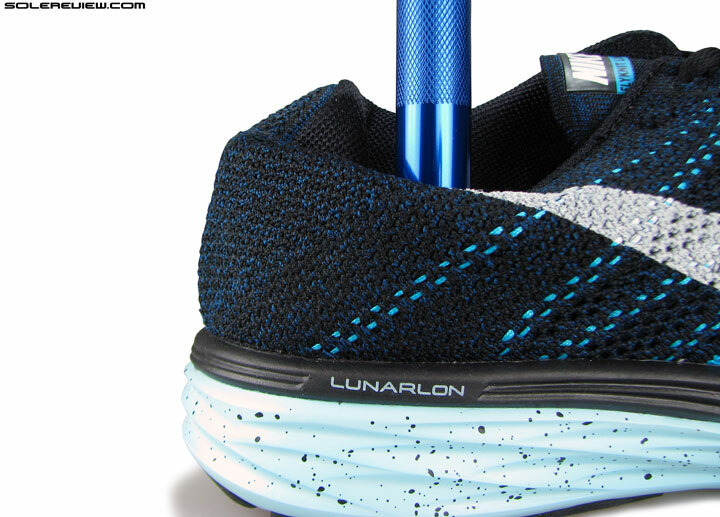 In the end, we could think of two reasons why the Lunar 3 feels the way (firmer) it does. First is the removable insole, which though unchanged in shape and overall design, is easier to compress (softer) than that of Lunar 2. On the other hand, the FKL-2’s insole felt as it had a little more resilience to it. It makes sense, as the firmer insole will tend to retain responsive cushioning traits better under weight instead of bottoming out. 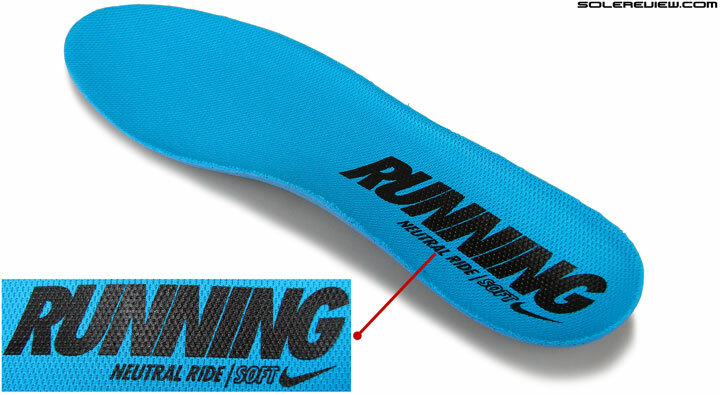 Having said that, our opinion is that the insole’s contribution to the shift in ride behavior isn’t as significant as the second reason. And which is what? The real ride influencer is the revised heel collar area. Because of the way in which the newly redesigned upper heel allows the foot to move its position further towards the rear. When that happens, the alignment of the foot in relation to the outsole changes – in the context of Flyknit Lunar 2 vs. Lunar 3. A little more explaining is in order, so we’ll get to it without further ado. The ‘pressure mapped’ design. 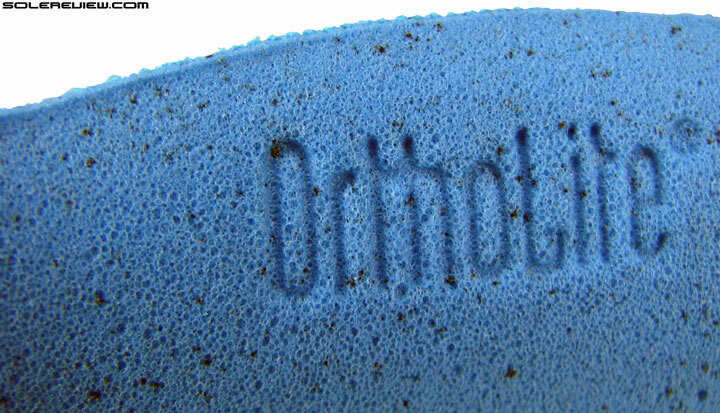 The concentric ring of outsole rubber separated by foam ‘moats’ responds to forefoot weight loading. Carbon rubber in heel – the edge has more of it, so feels firmer than midfoot. 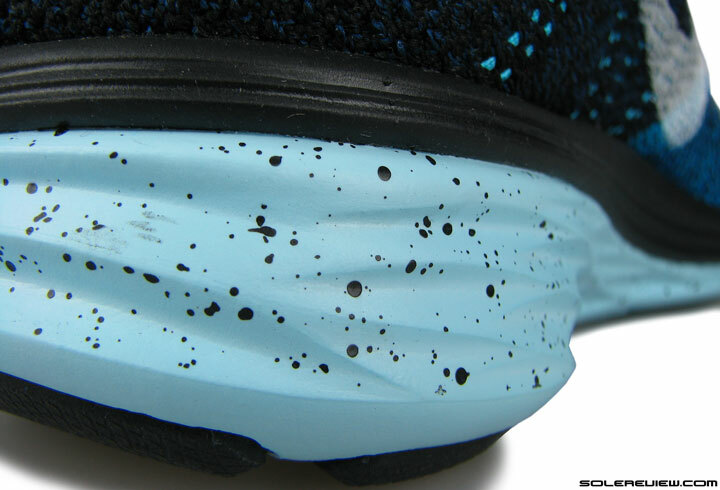 If you look at the Lunar outsole (same design for V2 and V3), the layout includes rubber rings arranged in a concentric fashion under the forefoot, an exposed foam midfoot and then a few rubber slabs grouped together under the heel. Depending on where weight loading happens, the midsole could feel soft, firm or responsive under that area. 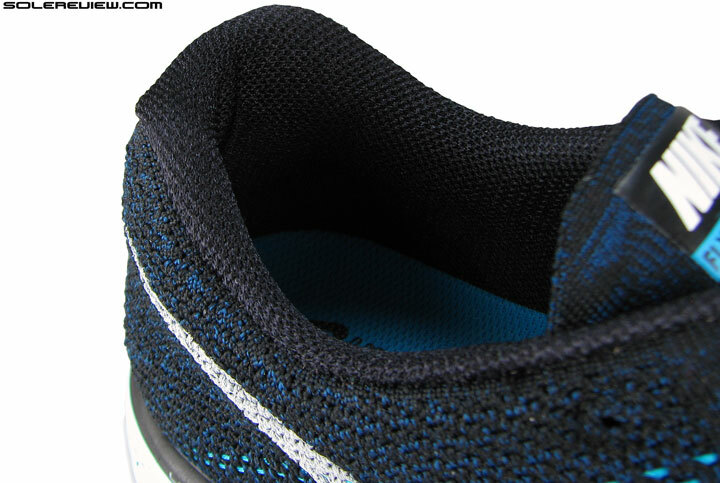 1) With the tweak in upper heel design, the foot position shifts backwards on the Flyknit Lunar 3. Compared to Lunar 2 (left), the foot increases its distance from the front. 2) Ditto for the heel, where the weight loading happens closer to the heel edge. 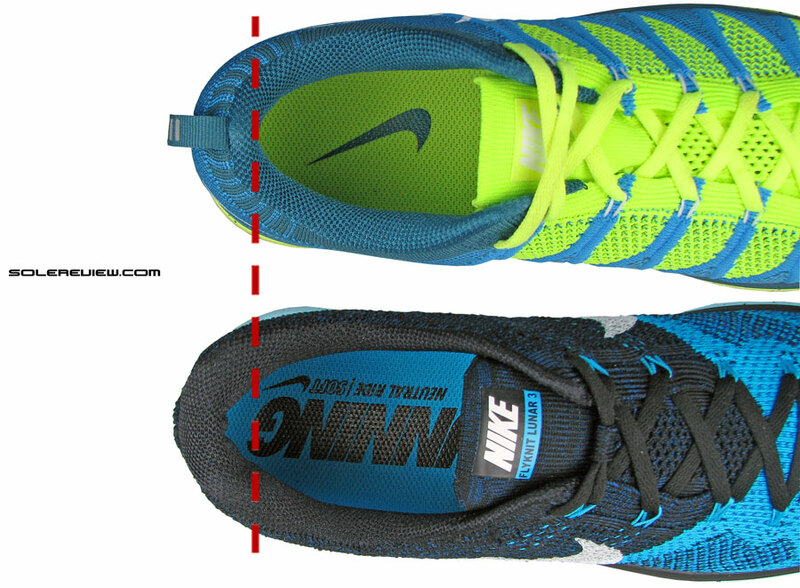 The red line indicates the difference in foot position on the two Flyknit Lunar versions. 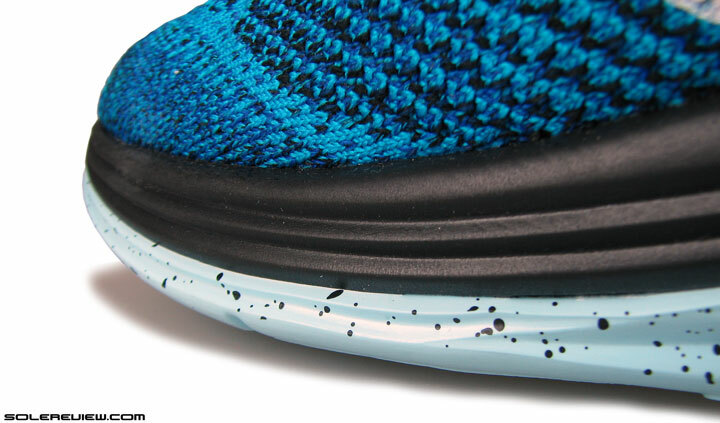 Since the Flyknit Lunar 2’s heel area pushed the foot forward, the ball of the foot was typically aligned over the forefoot rubber rings, and in the rear, a little further away from the heel edge. This allowed the forefoot to feel a lot more responsive either during footstrike or transition (for forefoot strikers), as the weight loading produced a piston-like effect from the ‘pressure mapped’ forefoot design. A similar thing happened under the heel outsole when running in last year’s Lunar 2. The forward biased placement of the foot had the tendency to apply loading not on the heel edge – where there is more rubber – but a bit towards the front, where the midsole turned softer with more exposed foam (and less rubber). Now picture this: when the relaxed collar (of the Lunar 3) moves the foot backwards, forefoot weight loading misses the center of the concentric rubber ring set-up. 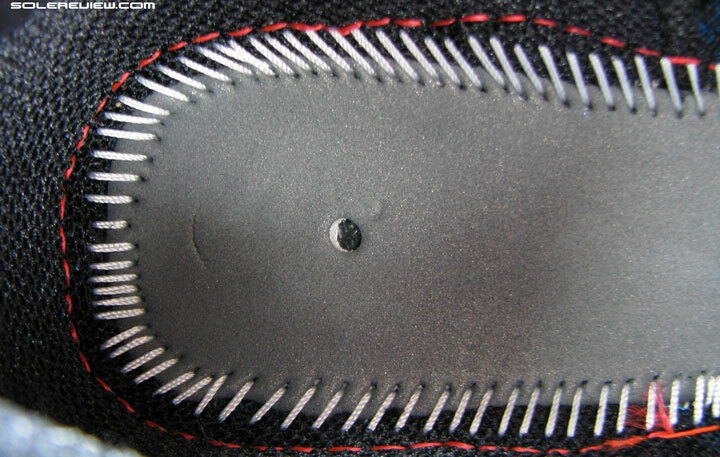 Back in the heel, weight ends up being applied on the harder part (edge) of the outsole. This net result is a firmer ride, slightly less responsive than Flyknit Lunar 2. None of this is a lesser aspect, but we thought to make sense of all this if you felt the difference. Line up all the three Flyknit Lunar versions, and the Lunar 3 rides the firmest of all. The variance isn’t as pronounced when V2 and V3 are compared, but if you jump straight from Lunar 1 to Lunar 3, the difference will be surely noticed. 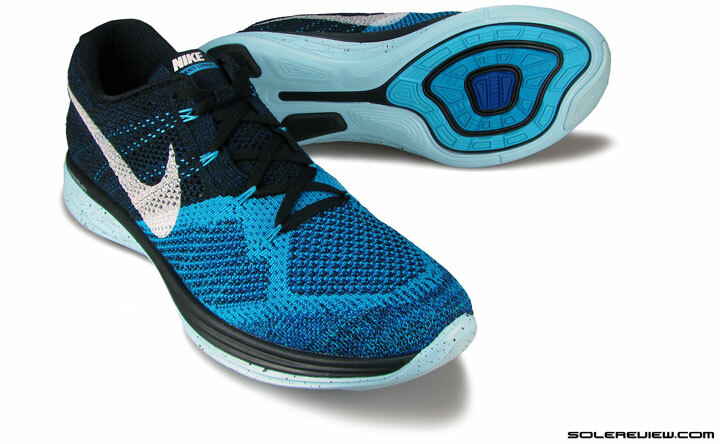 The 2013 Flyknit Lunar 1 was much softer owing to the outsole design. The V1’s forefoot had a cluster of independent rubber pods mounted on exposed EVA foam, each producing their own ‘pistoning’ effect as they retracted inwards under weight or impact. 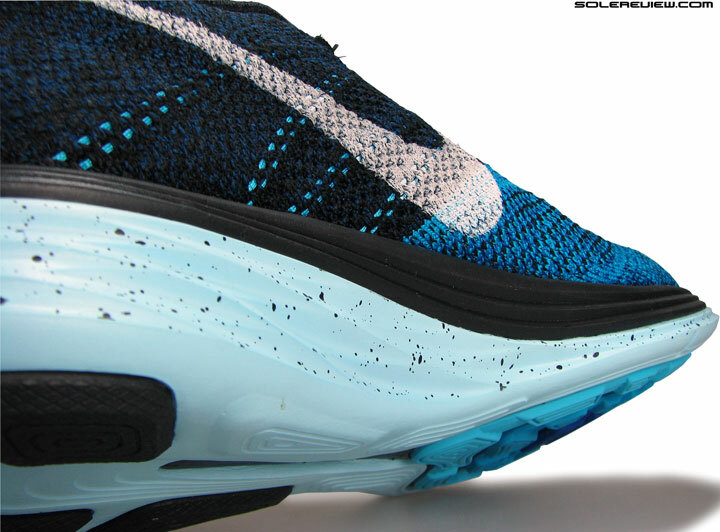 The thicker stack of Lunarlon foam in the front bodes well for forefoot striking and loading. Familiar ‘splashed ink’ execution from what we saw in 2014. Even midsole sculpting on either sides helps the Lunar 3 maintain a neutral cushioning stance. The change in midsole behavior aside, the Flyknit Lunar 3 continues to deliver a cushioned and smooth ride. The melding of Lunarlon (top) and EVA (bottom) helps deliver cushioning minus the mushiness which can cramp your pace and the level of support. There is an unmissable neutrality of transition; the EVA midsole wall design keeps away from playing the leaning game. Either sides have a balanced presence of accordion-esque lines running around the circumference, eliminating potential duality of midsole character. We have a feeling that many will take to the minor adjustment of ride pretty well. For the third iteration of Flyknit Lunar 2 feels a lot more linear, as opposed to the ‘responsive-in-the-heel-and-responsive-in-the-front’ character of the Flyknit Lunar 2. Agreed, the ride experience isn’t as sensory and reactive as it once was, yet this new-found aloofness has an appeal of its own. 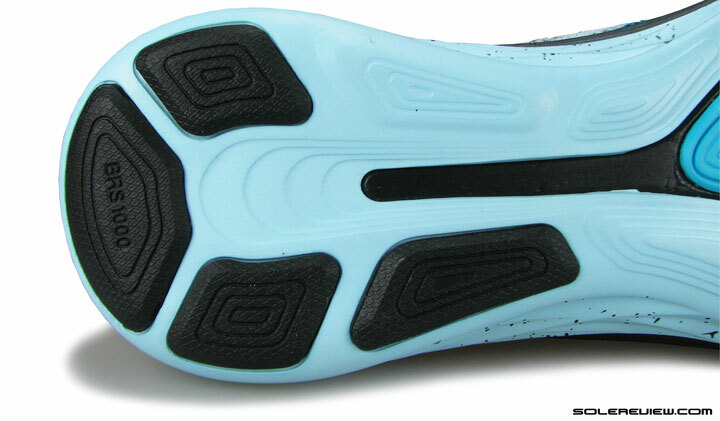 Medial midsole curves softly to prevent under-arch poke. It works surprisingly well for a variety of workouts. You can coax a lot out of the Lunar 3 midsole, as the latter is capable of performing under a wide range of operating requirements. The lightness and nimble footedness of the Lunarlon platform makes it suitable for shorter runs under 10k, and if you want to run longer, the cushioning will keep you going as long as your breath and lactate threshold don’t unfriend you. Transitions are kept smooth and efficient, both by the unbroken bedding of Lunarlon and a forefoot which strikes the right chord between being stiff and flexible. Midsole design also comes into play here, as the medial side swoops nicely under-arch and stops any potential pressure point from rearing its ugly head. While the Flyknit Lunar 3 wouldn’t be our weapon of choice for race-day, it fills in as a comfortable daily pacer rather well. The cushioning sits in an optimal place between soft and firm, and it performs without sacrificing ground feel. For those whom the Flyknit Lunar is completely uncharted waters, know that the upper fits and feels very differently from other knitted variants such as the Free Flyknit. It does not have the compressive elasticity of either Free 3.0 or 4.0, and instead offers a fit experience with a relaxed and spacious feel. In simpler words, this is a far more affable, everyday version of Nike’s Free Flyknit upper. 1) More room up front 2) Lacing and tongue starts late 3) Ungusseted tongue, no sleeve this time, and the flap is longer. And if you’re fresh off the Flyknit Lunar 2 boat, then we must most certainly point out that the refreshed upper opens up a larger amount of relative space inside. 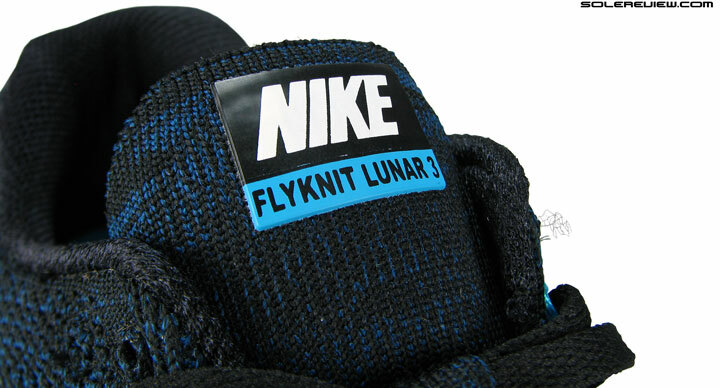 In that sense, the Flyknit Lunar 3 is closer to the original Lunar 1 rather than its preceding design. Though we’d like to reinforce the fact that the revised heel collar helps create more forefoot room by keeping the foot further behind, there’s a broader suite of changes which lends the FKL-3 a liberal nature of upper fit. Lacing increases its gap from the tip, creating more room. Even the tongue starts late. Makes for a smoother feeling forefoot ceiling. For example, not only does the lacing increase its gap by a full 10 mm from the tip, but the tongue also begins two lacing rows later. That implies a couple of things, namely that the forefoot ceiling becomes relaxed due to lower lacing pressure and reduced layering, and the other being the insides feeling smoother than before. Engineered. You’ve heard this buzzword before, right? 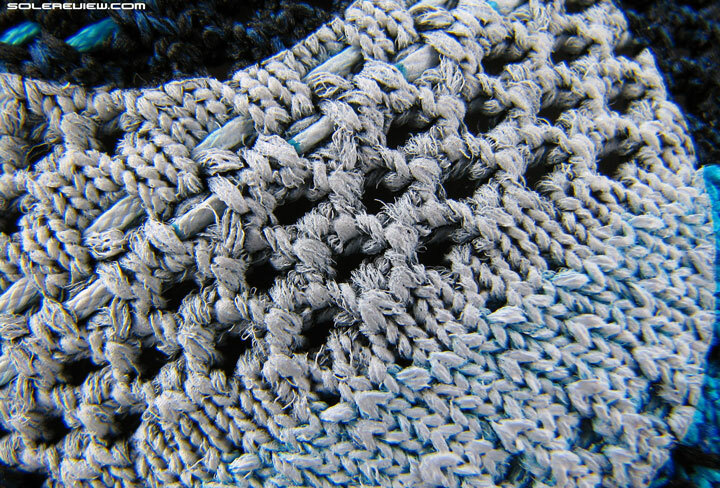 Open knitted in a few areas, denser in places which need to provide structural support. 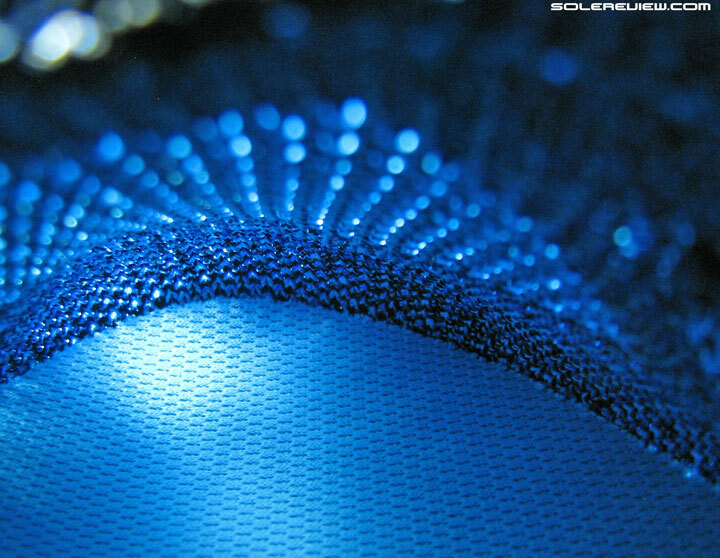 The Flyknit mesh’s structure is engineered (open in some areas and closed in others), albeit with a difference. The closer knit areas are not as densely packed as the Lunar 2’s mesh, making for a more easygoing drape over the foot. When these factors combine, it ends up in a sizing which is nearly half bigger than the Lunar 2. The empty space left over ahead of big toe is substantial, and most should manage with settling for a half-downsize. You still need to end up doing due diligence with a physical shoe fitting, as the results may vary based on individual foot shape. Providing more foot-room appears Nike’s new mantra now, the signs of which are evident in the relatively cavernous inside of the revamped Vomero 10, and latest versions of Flyknit 3.0 and 4.0. We haven’t laid our hands on the Pegasus 32, but we bet that’s going the same way too. Now only if domestic airlines could take a cue. Sorry, no sleeve or gusset this year. Part of the knitted upper, with a ventilation panel in the center. Tongue design reverts back to the non-sleeved type last seen on the Flyknit Lunar 1, but with a few notable tweaks. It doesn’t extend all the way up to the first row of lacing, so it ends up being shorter – yet with a paradoxically longer flap at the end. Though it lacks the seamless feel of the Flyknit Lunar 2’s sleeve, tongue slide is surprisingly minimal. A typical cause and effect put into practice, a description of which follows. 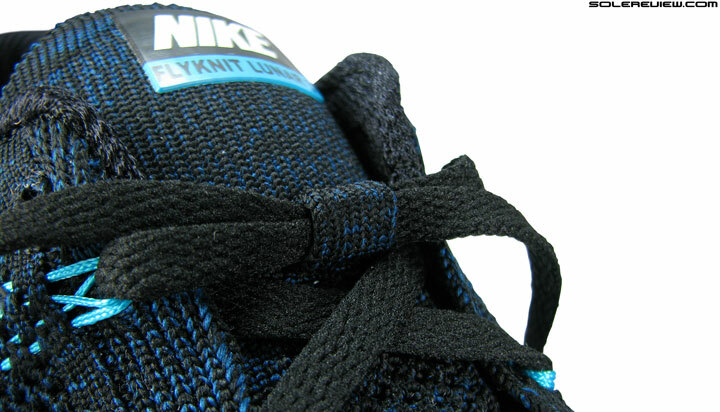 The knitted lace-loop is located closer to the flap edge. 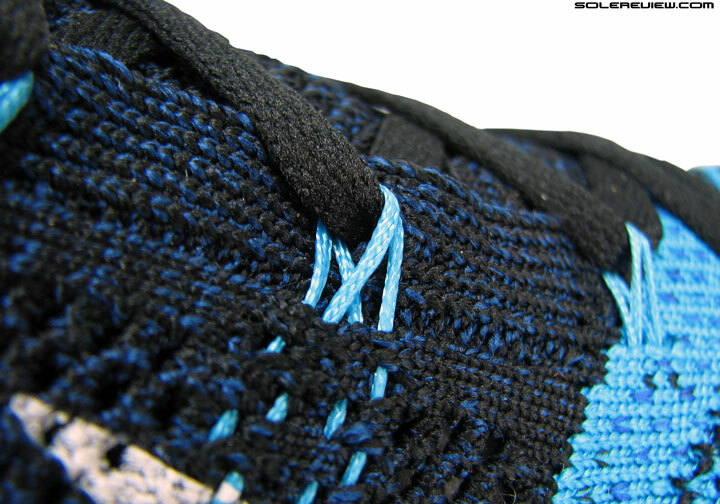 The lace loop – the one on the tongue – is placed closer to the top compared to Lunar 1. When you combine that with narrow lacing, the tongue is held securely in place as the knitted loop fills the gap between eyelet panels. The smooth sizing label does not occupy the tongue underside (on Lunar 2 as well), which gives the tongue flap more grip over the foot. Add these happenings up, and you have an anti-tongue slide formula which works. Ok, not in the same league as a gusseted tongue, but fares much better than the Flyknit Lunar 1. Nike’s ubiquitous Flywire is a fixture on this shoe. One less Flywire cord compared to last year. Can you see the last camouflaged (reserve) eyelet? Can you see it? The number of Flywire cords are reduced on the Lunar 3. Whereas the FKL-2 had five cords plus one regular eyelet, the Lunar 3 works with 4+2 lacing. The last eyelet hole is really hard to see in pictures, it’s only visible at closer quarters. On a related note, you have to be slightly cautious when lacing up. Too much pressure, and the thin tongue transmits it on the foot. Too loose, and you’ll find your foot sliding forward on downhill gradient, something which we noticed on the 2013 version too. Something to do with the thin tongue. No seam = smooth interior. Approved for barefoot use, with a caveat. Barefoot use is very comfortable, as you can bank on the benefits of the lining-free upper and ample ventilation. It would be worthwhile keeping in mind that going no-socks on the Lunar 3 also ends up opening more room. So it is ok if your sock-less usage is limited to a day or two in a month. If one plans on regularly wearing the shoe without socks, it is best to opt for the best fitting size in that state. For most, that should be a half size downwards. With the harder counter not extending upwards, the collar is a softer place to be in. 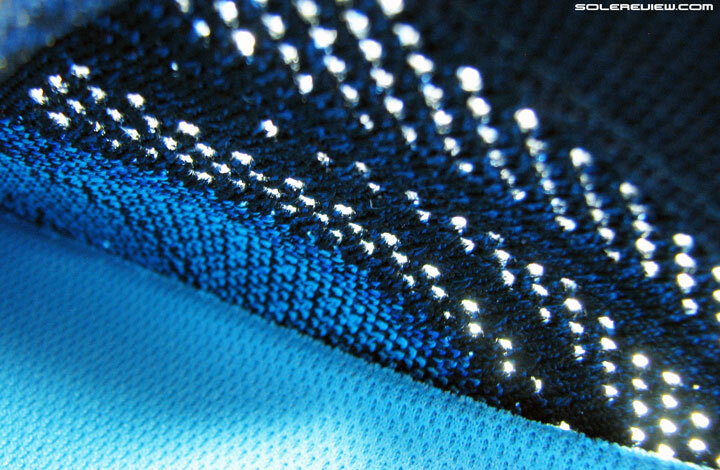 This mesh – Nike’s favorite material of choice when it comes to a soft hand-feel. Collar mesh is carried over from the Lunar 2, a soft and premium feeling fabric which is Nike’s go-to material in many of their shoes, including this year’s Zoom Vomero 10. The upper heel edges feel even softer this year, as the full sized internal counter is shown the door and replaced with a smaller shaped one. No heel slippage here; the upper grips the rearfoot well without pressing down on the Achilles, something which was a sore point for last year’s Lunar 2. Printed Swoosh logo like before, but with something extra this time. Mildly reflective in dark. But why not talk about it? One significant area of advancement is Nike’s use of a newly formulated reflective paint. Swoosh logos on Flyknit uppers have always been screen printed, but of late their application includes a reflective element. 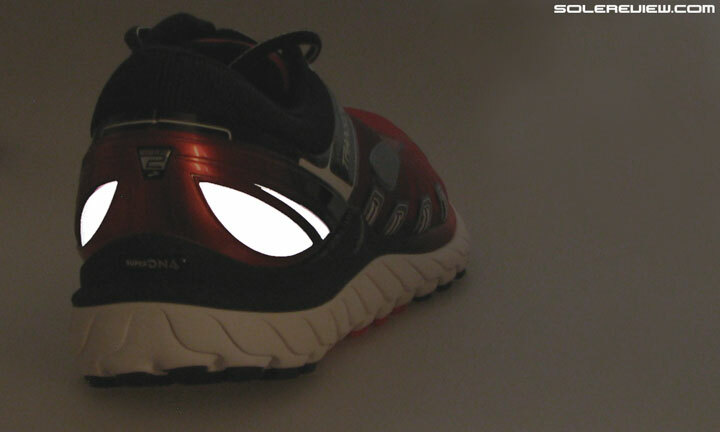 In low light conditions, the printed swoosh produces an effect which can be described as high visibility. While this is nowhere as bright as a standard 3M or equivalent insert, it is certainly useful from a safety aspect. Shiny paint, when seen through an Electron microscope. And you believe that? The backstrap with reflective strips – gone. So the side logo makes good for it. The fact that most retailer websites (including Nike’s own) omit mentioning reflectivity evidently points out to the fact that everyone’s warming up to it. Either that, or we’re seeing things by finding semi-reflectivity where there is none. But this would make sense as an element of substitution, as the earlier instance of reflectivity is no longer featured on the FKL-3. If you don’t know what we’re talking about, it’s the heel strap with shiny strips on top (picture above). The embedded Flywire cords after the 2nd row of lacing are spread over a wider area. The couples of issues which we encountered with can be pretty subjective, but we’ll bring it up anyway. 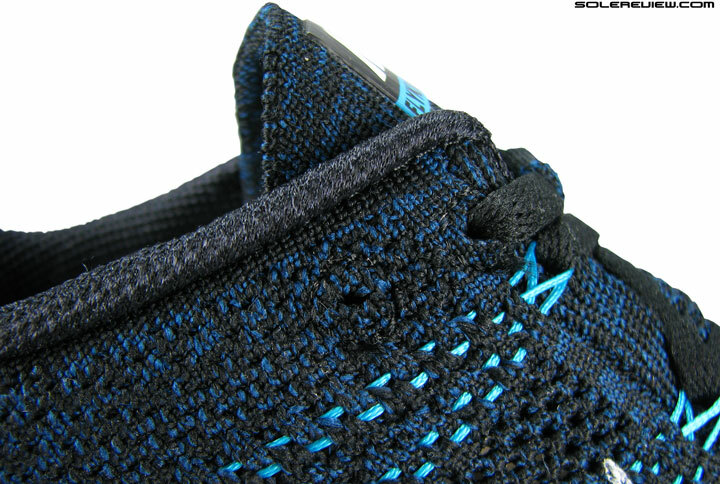 Midfoot Flyknit panels conceal the lacing cords, but if you are very sensitive to pressure, then the set of Flywire cords connecting to the second row of lacing might be an issue. Unlike the 3rd and 4th Flywire loop which is more spread over, the 2nd one shoots straight up and localizes pressure over a narrower area. Pressure from the forward loops might be felt by some. And there’s no skipping the Flywire trick this time, because there are no eyelets. A slight pressure is felt underneath this particular Flywire on the medial side, though not to the extent of being uncomfortable. You just feel a higher level of pressure relative to rest of the Flywire cords. The second feedback is closely related to the first. 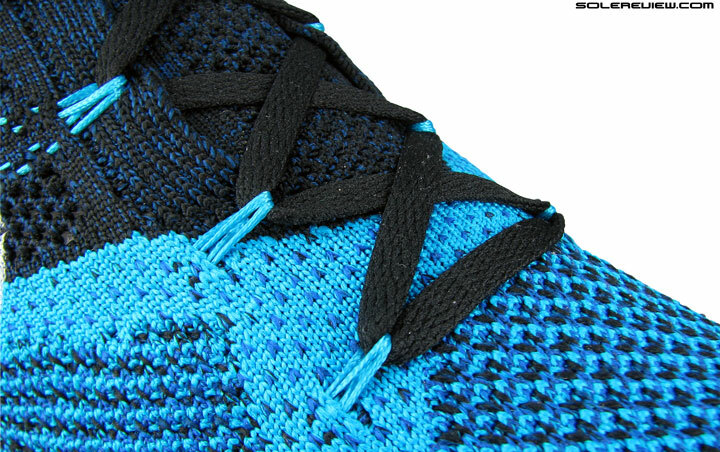 In the first two Flyknit Lunar editions, each loop of Flywire cord was paired with its own eyelet. This meant that if you did not want the tighter wrap, you could customize the fit by simply skipping lacing through the loops. Unfortunately, that hack is not a possibility on the first two rows of Lunar 3 lacing this year. There’s no option but to pass the laces through the Flywire loops, so you’re pretty much stuck with the standard fit without recourse. 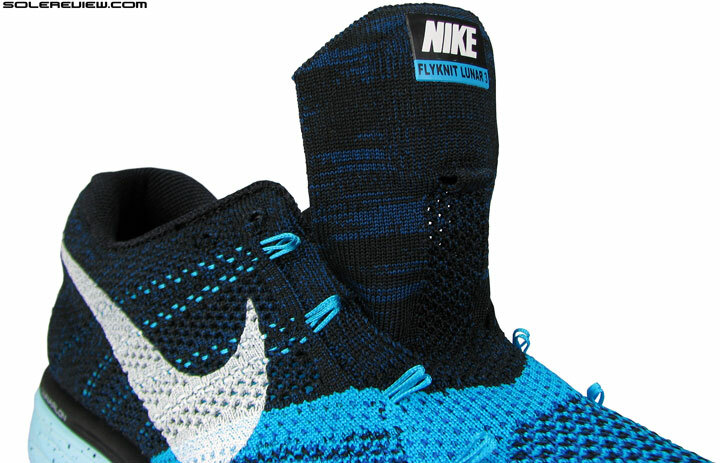 Very likely contender for the best-Flyknit-Lunar-so-far title. That apart, as a complete package, the Nike Flyknit Lunar 3 is the perfect-est update so far. The upper is brilliant, matched with a seamless quality of ride. No more expensive than what it was in 2013 and ’14, and that’s good pricing manners indeed. No, no, this is quite different from the adidas Ultra Boost, regardless of the Lunarlon+Flyknit mating. Before we wrap up, a note for the select few who might be interested in knowing how the Ultra Boost and Flyknit Lunar compare. That query is a perfectly understandable one, given the fact that both shoes represent either brand’s take on mesh and foam supreme-ness. Just know that while the comparison is theoretically warranted, both are completely different shoes. The Ultra is compressive in upper feel and soft underfoot, while the Flyknit Lunar 3 has a relaxed fit and a firmer midsole. 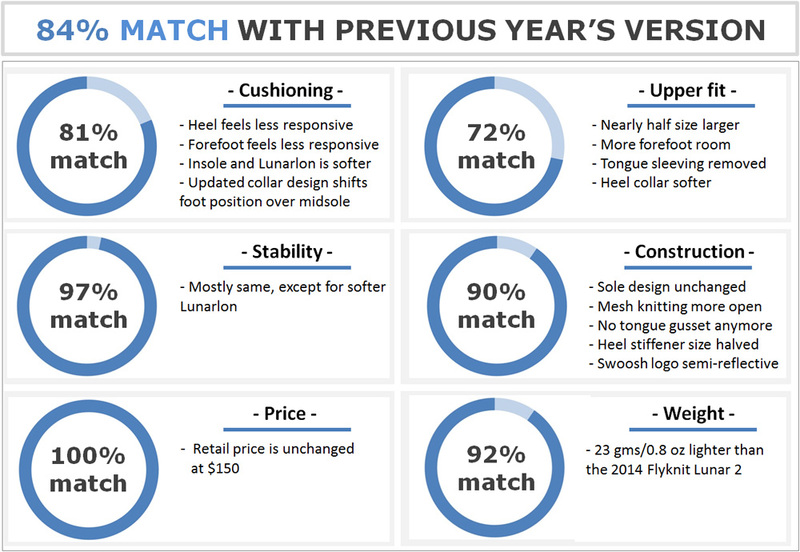 Looking to upgrade your older Nike Flyknit Lunar 2 to the latest version, but not sure how the 2015 model compares? We can help here. The following infographic is a ready-reckoner for what changes you might expect in the new model vs. old. To make this more fun, we’ve put in a system of percentage match, which calculates a weighted average for a set of attributes. How does it compare in cushioning and softness to the Vomero 10 and Pegasus 32? Haven’t tested the Pegasus 32 yet, but the Vomero 10 is softer and responsive (in the heel) than the FL3. Will you be reviewing the Saucony Ride 8?? Another great and thorough review. I really like the fit of my Flyknit Lunar 2s, I am a US 11 in Nike. Should I stick with the 11 or go to a 10.5? Thanks. We’d personally go half a size down, but you definitely need a physical fitting to confirm. This is what running shoes are, they can be good, great or even bad depending on the person who runs in them. Thank you for the detailed comment and feedback! you note that you wouldnt choose this for race day. I love my lunar 2s, ran my last marathon (and most other races) in them. i primarily do triathlon of all distance (mostly HIM) and i am a mild heel striker and prefer a higher heel to toe offset. I run about a 1:30 half for reference. what would you recommend for racing? Regardless of what reviews say (including ours), the best race day shoe is the one which you find comfortable (fit+support+cushioning) and suited for your pace. If you love your Lunar 2’s, we see no reason why you should switch. Our personal favourites matching the description of a higher heel drop, lightweight race shoes would be the adidas adios Boost and the Nike Lunar Tempo. I needed a suggestion to what shoes to buy so I can use them for playing Tennis, badminton, running,walking long distances and as Gym shoes. Which is best fit for my requirements? These are not suitable for the activities you have mentioned. Better off buying something like a Nike Metcon 1. I am training for a full marathon and am unsure about whether to buy the nike flyknit lunar 3 or the nike zoom streak 5. I had the flyknit lunar 2 before and was very happy with it. I am a neutral lightweight (140 pound) runner. Which shoe would you recommend? Thank you for the comment! The Zoom Streak 5 is a great shoe for the occasional fast day, but might be harder on the foot when it comes to everyday training. Would advise buying the Lunar 3, also in the context of your positive experience with the Lunar 2. Hello! I’m considering on getting a pair of these, but i really don’t know. I’m looking for a race shoe. My current running shoe lineup is… Nike Lunarswift 3, Adidas Ultra Boost, Nike Free 3.0 and the Adidas Terrex Boost. I have considered the Adidas Sequence 7 Boost as well as i’d prefer a more stable shoe unlike the Ultra Boost. The Terrex Boost is somehow the level of cushioning i’m looking for, as well as the durability it offers but a softer outsole, though in a whole different level but yes, a durable shoe in which i could trust not to tear apart like the Ultra Boost. Would you say the FKL3 deliver what i need? Maybe some options? (the all new Nike Pegasus 32, Adidas Energy Boost 2 ATR, Adidas Supernova Glide 7 Boost?) Thanks! (180cm / 79kg – 40 to 70 km a week). Thanks! Replied to your earlier (same) comment on another review. Sorry about that, i didn’t get the ‘response email’ … I noticed this FKL3 thread when i commented on the latter SGB one. I haven’t tried the Speedform Gemini, but i might whenever i got the chance but i usually prefer a slightly snug fit, like the one i get from the Ultra Boost’ though i found that they’re a little too bouncy for me ATM for a firmer ride is what i’m looking for. D’you say that the FKL3 would meet that? I’d love to see your review on the Pegasus 32 as well. Thank you again! The Speedform Gemini sounds like right up your alley, then. Firm ride, and a snug fitting upper, though not stretchy as in Ultra Boost. 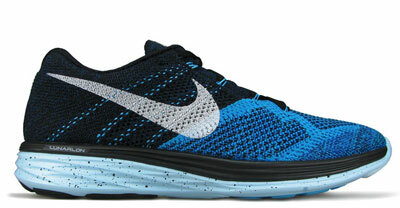 The Flyknit Lunar 3 is firmer than the Ultra, so yes, you can try that as an option and see how they feel.. But the FLK3 upper is pretty relaxed, and does not have the Ultra’s sense of wrap. Our Pegasus 32 review should be published sometime in early July. The FKL3 are a great summer running shoe (or when it isn’t wet). I have been running in them the last 4 weeks. I was initially going to buy the LunarTempo but they were to narrow for my feet. After reading the review on here I was also interested in the NB 1500v1 but they felt more like a racing flat which wasn’t 100% what I was looking for. I am running usually between 5 & 15km sessions, 3 to 4 times a week. I am still ummming and ahhing whether to go a pair of NB Zante’s to keep in rotation as they fit nicely and felt good when I tried them. Anyway back to the FKL3, they are ready to go straight out the box but they did take some getting used to as far as the sole goes, in comparison to my Asics (these are my 1st pair of Nike Running shoes). I experienced slight pain on the inner ball of both feet (I’m a forefoot striker that runs on roads) after about the 6-7km mark when I used them in the 1st few weeks. This seems to have gotten better but I believe the fact the sole is very soft & adjusting to a different type of shoe are the causes (my Asics are twice the weight btw). I rotate them with my other shoes and this problem has gone away. Personally I would prefer a little bit harder sole (they seem to be the same as the Lunar Glide 6’s). Also I don’t think for the price these are overly durable. I can’t see them lasting much more than 600km but time will tell !?!?! I am definitely satisfied and would recommend them (the Flyknit, comfort, look, speed ..woooooow). Like any shoes, do yourself a favour, go to the shop, try the various models & see what works for you. TOP REVIEW ASWELL !! THANKS SOLE REVIEW. Much appreciate your detailed feedback, thank you for the comment! Would you recommend this shoe for a forefoot striker? Thanks! Would you recommend the FKL3’s or the peg 31/32’s? Close call, but we’d pick the Flyknit. Hey, I’ve been running on and off for a while mostly 5ks at a slow pace. I’m getting into running again, running 5 times a week roughly 30mpw to train for a half marathon a 10k before that. I’m currently running in an old pair of adidas trainers which I’ve had for years but I am wanting to upgrade. Which trainer would you recommend? Thanks. What is the name of your adidas trainer? Within adidas, the Supernova Glide 7 Boost is a great shoe if you’re looking for a non-stability model. The Flyknit Lunar 3 will also do, but coming from adidas, your first stop should be the Glide Boost. The Flyknit Lunar 3 is something you can try, though it lacks the deeper cushioning of the LG 5. Among other brands, alternatives are the Brooks Ravenna 6, the New Balance 860 V5 and the Asics GT 2000 3. Not the same as LG5 of course, but can fill in upto some extent. Hi, I know this is primarily a running shoe, but I’m looking for a flexible pair that I can use as gym shoes, as well. Just wondering if flyknit lunar 3 fits the bill. In my own experience, most running shoes would do well for gym training. I’ve tried several running shoes with only one ‘complain’… Upper & toe box support. As you may know, some exercises may need extra support and probably you won’t find it in a running shoe. I had a pair of FKL2s and in the end i had to switch them, the toe box tends to wear out due to the constant friction with some of the training equipment and sometimes the upper didn’t help a bit specially on force wise sessions regardless the Flywire. In the end, I got the Adidas Crazytrain and i’m quite happy with the results, the upper support is the one i needed. But furthermore, i’ve found they’re very resistant and flexible enough to get through demanding sessions. My feet doesn’t feel tired anymore. I can even have short jog sessions (3k-5k) on them with no issues. Have you considered the Nike Free 5.0? The planted and lower to the ground feel of the midsole makes the shoe stable for gym workouts. Grips well on synthetic flooring too. The only downside is the flimsy upper so you need to watch for the stray weight tipping over your foot. 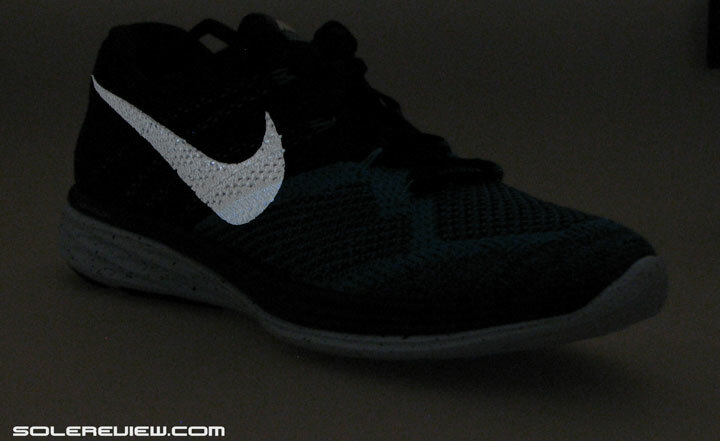 The Flyknit Lunar 3 can be used, but given a choice (within running shoes), we’d go for the Free 5.0. What about the rainy season? I don’t mind getting my shoe (or sock) wet but would it ruin the shoe? Nothing will happen to the shoe, but there is going to be a lot of water inside. The shoe won’t dry in a few hours, especially assuming that humidity level in your country is high. Great review guys. Im about to get them but the damn Kayanos 21 are in the way… Which one would you recommend ?? Depends on which part of a shoe appeals to you. Fit? Cushioning? Responsiveness? Weight or heel drop? Coming from ACL surgery i would say cushioning. I tried the free run 3.0 but my knee protested! My old kayanos 15 felt better. Are you open to buying adidas? The Glide Boost is a great blend of cushioning and support. Sure, why not. Glide boost 7 right? Would be helpful to know your shoe history. What has worked for you so far? You could consider the Nike Pegasus 31/32, Saucony Breakthru, and the adidas Supernova Glide 7 Boost. Hi, I am looking for running shoes for Chicago Marathon, so far I’ve been running between Asics Kayano 20, Newton Motion III and Asics Gel Lyte 33, I have flat arch and my weight is 75kgs, what would you recommend? Could think of the UnderArmour Speedform Gemini, adidas Supernova Glide 7 Boost, Brooks Adrenaline GTS 15 as options. It would seem we’re all over the place with these three very diverse models, but we feel each of them might have something to like about. Do you recommend it for flat feet runners? Hard to generalize, so you have to a little more specific. Like what qualities are you looking for in a shoe? What are the models which have worked for you in the past? The flywire puts a lot of pressure on the outside of my foot at the base of my big toe. I did not have this problem with the flyknit lunar 1. Is this something that would stretch out or will it stay this way? Definitely need to return if it won’t ease up. Would the Flyknit Free 4.0 have this problem? 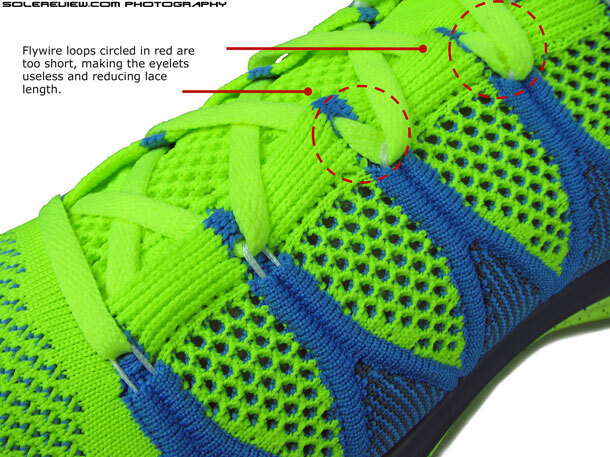 The Flyknit Lunar 1 did not have the issue because the first row of lacing was not connected to the Flywire cords. In the FLK-3 it does, and hence the snugness at the base. Since this is due to the Flywire and not the mesh material itself, it is unlikely that it will ease up. 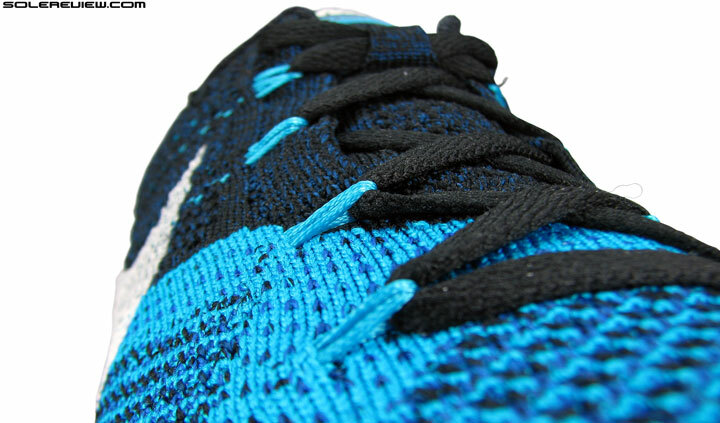 The 2014 Free 4.0 Flyknit also puts pressure at the base of the big toe. 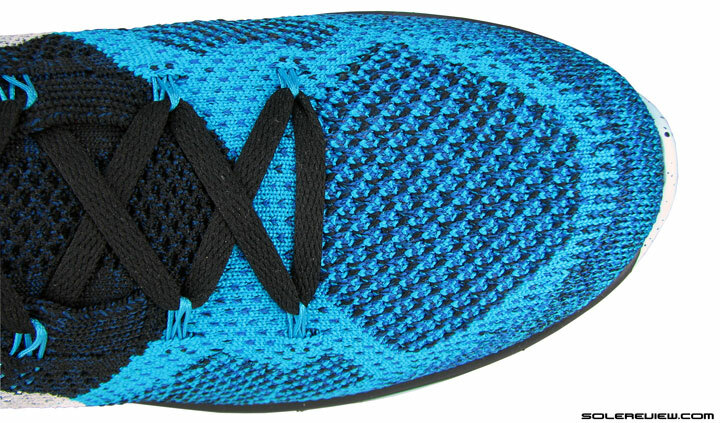 But the 2015 Free 4.0 Flyknit (review up next) does not, as the upper has a lot more room. The lacing is connected to the Flywire cord on the 2015 version, but in case you feel any tightness, simply unhook the lacing from Flywire. I just bought a pair of these and really like the ride. You were right regarding the cushioning, it does feel firmer under foot. However the ride is also more even with no noticeable difference in responsiveness between the heal, mid and forefoot. I went with my regular size because I always wear socks and like a bit of room in the toe-box. I FORGOT ABOUT THIS REVIEW!? NOOOOOOOOOOOOOOOOOO! I do have some sort of shin splints. Do you think this is the right shoe to run with? And if not, what would you recommend? Very hard to generalise, Melissa. Shin splints have varying causes, and difficult to recommend a shoe which can alleviate that. A couple of ways around this; a) visit a physio/equivalent and understand what’s causing the soreness, and then zero on appropriate footwear b) if there was a shoe which did NOT cause you shin pains in the past, then your next purchase can be based off that, meaning buying a similar shoe. Shocked that you did not review the LunarTempo. One of the best shoes I have ever run in. I feel that you would love it. As a matter of fact, we’ve had the Tempo since mid May, and the review is up next after the 890. Go to our facebook page, look at the top right corner of the cover photo! Good to know. I will be anxiously awaiting the review. Hello! I’m about to buy a new pair of running shoes, but here’s the thing. I’m relatively new in this running thing. I started running in February 2015, I’ve only have one pair of running shoes, Nike Dart 9. Initially, I bought them just because I wanted to run a little bit. But well, the thing is that I fell in love with it and here I am; running up to 16k. My goal is to run a half marathon, any time this year. I have experienced knee pain while running long distances and someone told me it’s because I’m not wearing the right running shoes for my feet. So, I decided to look for more info about it and buy the right running shoes this time. I’ve noticed I’m a neutral pronator. I really would like you to recommend what you think is best for me. If you’re new to running, and have already ramped up your daily mileage to 16k (we assume per run), then the knee pain is likely a result of overuse injury – going too far too soon. We would recommend that you start including plenty of conditioning/strengthening for your body, coupled with tweaks in running form (only if needed) and proper nutrition. Once you have that covered, then most shoes will work for you. The Nike Vomero 10 is a great shoe, and so are models such as the adidas Supernova Glide 7 Boost and Nike Pegasus 32. Thanks for all the great reviews! I was almost certain I’ll get one pair after reading your blog. However, there is something worth mentioning (and yet not included in your article) when I tried them on this afternoon: It seems the new Flyknit Lunar has narrower upper in th forefoot area than its predecessors. I have relatively wider foot but never have a problem fitting in size 9 from any Nike runners I owned (Flyknit Lunar1,2, LunarGlide 5,6 and etc.) But this time I have to get a 10 to have a comfortable fit. I wonder whether anyone else has noticed the same issue when he break them in. And now that I will have more space in the toebox area, would you suggest I still go on and purchase them? Would you also write a review on LunarEclipse 5? I am considering getting a distance runner as well. We felt it was the other way around (more room on the FLK3 than 2). But it is possible that the widest part of your foot is positioned slightly towards the rear, so the midfoot (which is tighter) ends up cupping your foot. Thanks for such an extensive, considered review – You’ve covered so much I wouldn’t have though of! While I love my older version, I am concerned that the Flyknit laces will break like 3 have in my current ones. Any thoughts? (I feel Nike should replace them but I doubt they would). You’re welcome, we do the best we can! Have no idea on the laces breaking. Never had that happen to us! 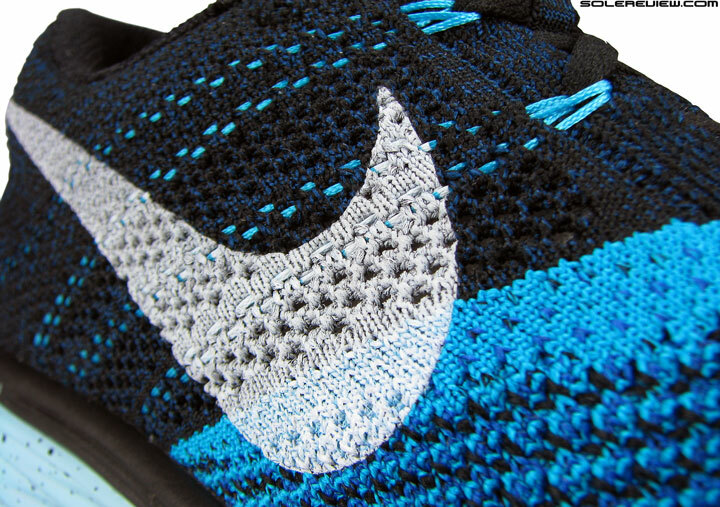 When I say “laces” I mean the holes the laces go through (that are supposed supported by flyknit “strings”). Three of the strings have broken and two of the holes have ripped through. (I would recommend the insertion of eyelets in each hole to reinforce them but of course that would cost Nike too much). Thanks for the explanation. We’ve yet to experience that on the Flyknit Lunar, though. Thanks for such an extensive review – I’d been looking for a review that really compares the 2s and 3s, and I will definitely be going to find as many pairs of the 2s as possible now. I came to the 2s after another brand loosened the heel collar and removed some upper support from the forefoot in an update, which ended up aggravating my minor shin splints to borderline stress fracture. I found the 2s to be absolutely perfect for my foot shape and step (I have narrow heels/feet and high arches), so the fact that they’re going in the same direction is soul crushing. Is there anything out there that matches the 2s more closely? Don’t have an answer for this, thought hard about alternatives, but drew a blank! About me: I am one of the few people with slightly wide and flat feet, but am a forefoot, neutral runner with good form. The employee at my local running store was pretty surprised since it means I have more options for running shoes. I’m new to your blog, but wanted to thank you for all the extensive reviews on so many models. I’m itching to add another pair (or two!) and wanted to see how the Nike FKL3 compared to Mizuno’s Hitogami 2? I’m slowly getting into running as I train for my first half marathon, and as much as I love running in the Mizuno HG2, my only complaint about the shoe is that every other run (4-5 miles) I find the toe bumper and seam a bit constricting (somewhat pinching at times), as the shoes run a bit more narrow in the toe box. It’s not particularly painful, but I am worried that once I increase my distance to 8 miles, pain will occur. The rest of the shoe feels great (especially insole) and I appreciate how lightweight it is, with the optimal stiffness and support for a low profile shoe that I look for. You mentioned that the Lunar 3 is seamless, which is definitely a plus. How would you compare the stiffness of the insole+sole on the Lunar 3 relative to the Hitogami 2? I guess I rather quite like the minimal compression that HG2 has. I haven’t personally tried on the shoe yet, but they look great and the heel to toe drop is very similar (10mm FKL3 vs 9mm HG2). In addition, how sturdy is the flywire through daily usage and would you not recommend wearing these in case of rain (e.g. foggy SF bay area or Seattle weather)? Can’t wait to see your review on the Lunarglide 7 later this month, Cheers! If you’re wearing the HG’s, then it would be a smoother transition if you chose the LunarTempo instead of the FKL3. You mentioned that you appreciate the slightly stiff ride and lack of weight. The 8mm drop LT is more cushioned than the HG, but is incredibly lightweight, more so than the HG2. The Flyknit Lunar 3 is much softer than the HG so that might be a turn off for you. As far as the durability of the Flywire loops are concerned, nothing to worry about. They last through the life of the shoe. Wearing summer shoes in wet weather (we’ve ran in shoes in Pacific Northwest and Bay area too) isn’t recommended if you don’t like the damp feeling inside the upper. That said, the effect of water is less of a problem on lightweight shoes, as there’s lower weight to be dragged around. Our other low profile favourites are the New Balance 1500 V1 and Zante, and the pairing of adidas Boston 5 Boost and adios 2 Boost – though both the 3 striped shoes have cramped toe-boxes. Hello! First of all thank you for your comprehensive and unique reviews! I need your advice on sizing. I’d like to buy a pair of Lunar 3 online as they are not available in my country. Nike’s size chart is useless for me: it defines my size as 12US or 45EU (my foot is 11 3/8 inches), though I always wear 43.5EU. In the store I tried: Lunarglide 6 – 10.5US was ok, and Pegasus 31 – 11US was good. What are your thoughts on Lunar 3 sizing for me? Thank you! We would recommend that you play if safe and order the US 11. In my experience with this shoe I find the insole to be inadequate. I replaced it with the insole of my old Asics Kinsei 4 and the shoe now has better cushioning and a tiny bit more support. With the original insole my feet were quite fatigued by the end of the day (I work in a gym). I also find this shoe to be overrated. 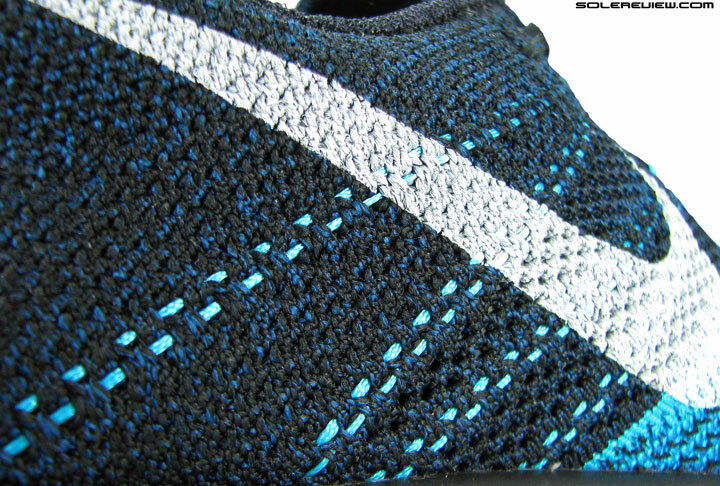 Sure it looks good but the all Flyknit construction gives too much “play”, it gives you the feeling that your toes would go past the end of the soles anytime you would need to stop abruptly. I have both the Lunarglide 6 and 7, now those shoes are performance shoes! Fabulous review, as always. Thanks. My problem is that I’m in between sizes — I have “Morton’s Toe” so the 11 hurts my largest (second) toes and the 11.5 is just too loose and my right heel slips. Otherwise, I really like this shoe as I too feel it to be a bit firmer which works well for me and I have trouble running on marshmallows. II’m a thin 53 year old runner who runs 2-3 times a week for weekly mileage of 10-15 miles. I have a fairly skinny foot. Id like to up my mileage. Any ideas for other shoes that might work for me? Thanks! Mizuno’s tend to have more accommodating, broad toe-bumpers. So perhaps the Wave Rider 18, Inspire 11 are worth trying. 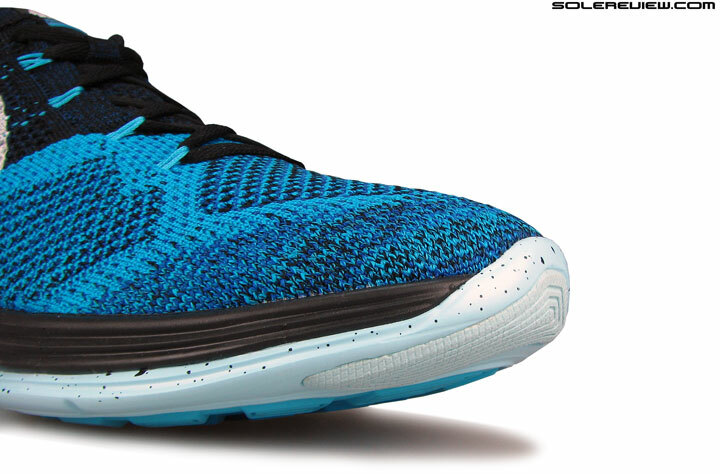 Would the Flyknit Lunar 3’s be a good pair of shoes for recovery runs? I’m a forefoot striker and i’m having trouble deciding between these or the Vomero 10’s. Forefoot striker, looking for an easy run shoe? The Vomero 10 is what we say. Do you guys have any plans on reviewing the air zoom odessy? I just saw it on nike’s website and it looks like a combination of the structure and vomero. Yes, likely first week of October. Quick question, I have a pair of Peg 32’s…which has more forefoot/toe box room, the 32’s or any of the Flyknit Lunar models? Specifically where the first lace goes over the top of the foot..I found with the 32’s I have to leave it as loose as I can and it’s finally starting to break in, I have a wide forefoot and high arch, log 25 to 30 klm a week…also, how does the cushioning compare between the two in the heel and forefoot? I am really curious about the FN3 and older models so I want to compare it to the Pegasus…but I would have to order it in so any help would be great…I am also in between a 9 and 9.5 for the peg and went with the 9.5 so I am guessing I should half size up with the Lunar’s as well…? 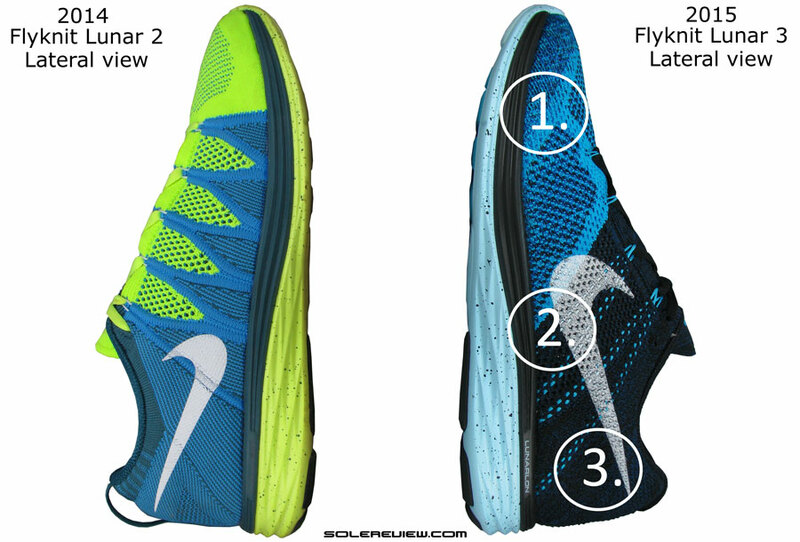 1) The Flyknit Lunar 3 has more forefoot, toe box room than the Pegasus 32. 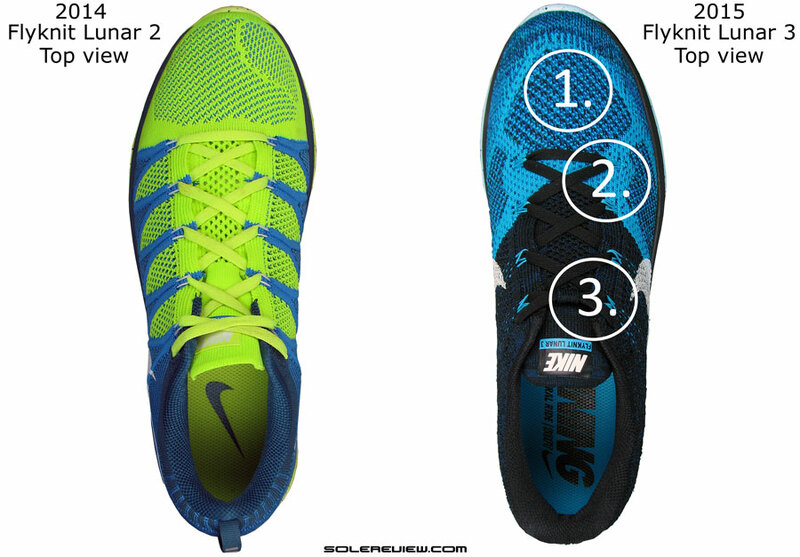 2) Heel cushioning is better on the Pegasus, while the FL3 is more cushioned under the forefoot. 3) The Lunar 3 has a higher toe box than the Pegasus 32, so you might do ok with a 9. However, we strongly recommend a fit test to see how the toe box feels. Hi there! I’ve been running in the Lunar 3s since they came out and really love them. My only question as we head into the winter is whether they will turn out to be a good winter shoe or not? I live in an area where we don’t get a ton of snow, but when we do it’s generally mixed with rain and ice so we have a nice cold slush around for a lot of the winter. How do you think these shoes (or any Nike flyknit for that matter) will hold up? Is there a shoe with a similar ride to the Lunar 3s that might be better for wet weather? These aren’t great for wet and cold weather, as the Flyknit upper lets the moisture in. Nike comes out with their water resistant ‘Flash’ assortment every winter, but it does not include Flyknit models. There is a workaround, however. If you’re ok with running in slightly thicker socks, then a pair of waterproof Sealskinz running mid-socks should take care of the water/cold problem in your existing Flyknit Lunar 3. Thanks so much, I’ll check those out! I currently have Nike Free 4.0 2012 model that I’ve been using since they were brand new. I just started running 5k’s and 10k’s 2 months ago for the first time and some people recommended that I get different shoes for 10k runs up to half marathons as I’ll injure myself in these. I only want to stick with Nike’s. Could you give me any recommendations? I’m 5’7, weigh 140 pounds, and wear 9.5’s Prior to people telling me these Free 4.0’s aren’t good for running, I’ve had no issues with them. The size, fit, weight all seemed fine to me. But again, I’m not knowledgable in running as I just started 2 months ago. If you’re used to them, the Nike Free 4.0 has sufficient ground protection – a lot more than racing flats, at least. 3) Nike Pegasus 31 or 32. I have a pair of Pegasus 31 with 900 kilometers… I would like to find the next perfect model. I’m 181cm, 80kg and 43’40 for 10k. I mainly run 10k and I have a goal for half marathon. Thank you for your help and for all the reviews !!! We’d close our eyes and go with the Nike LunarTempo! Very lightweight, and plenty of the fast feel. Enough cushioning for 10k and half too. Thank you very much for your advice !!! Enouough cushionning on the lunartempo for the traning sessions (Recovery run, long run and progressive run ) ? Yes, works for all. The Flyknit Lunar 3 in case you need greater outsole durability and a little more cushioning. Hi, I tore my achilles a couple of years ago, and my feet have lost alot of strength. I am looking for a shoe that allows me to rehab, train, and lift weights. I can’t run yet, but stability and cushioning would be great so my ankle isn’t collapsing from weight lifting and im popping another achilles. (runner’s fear!). I owned the pegasus 30, which in my eyes were perfect, allowed me to have cushion for cuts distance, weight. My feet also respond to cushion. I have walked all day in new york city with roshe, and died. the air max 90 kept my feet alive every day. Pegasus 32 vs Flyknit Lunar 3? I have both pairs ordered, and can’t decide which might be better for me to train in (weights, rehab, eventual run). The lunar feels more snug, and slightly heavier than the pegasus 32, while the pegasus 32, don’t even know i have them on! Between the two, the Pegasus 32 seems like a better choice! I am a runner who runs 4-6 miles every other day. When I’m not running I am doing cardio. I am either doing elliptical, stair aster, pre cor… I currently run in the lunar glide 7. I enjoy them. I tend to run on my toes at times and need some cushion and support. I don’t like bulk. Curious to what you would recommend out of these since you have tried them both and what you liked best. I also considered the lunar tempo nut not sure if they are durable enough or will have a long life. The Flyknit Lunar 3 is more cushioned than the Lunarglide 7, but the Glide 7 is more supportive. We don’t have long term usage experience on the Tempo. 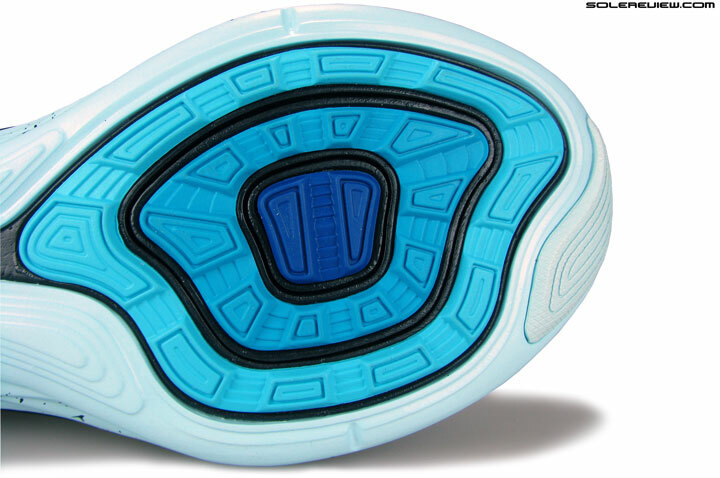 That said, our guestimate is that the outsole should last at least 70% of what a Lunarglide 7 will do. Flyknit Lunar 3. Lighter, and better forefoot cushioning. Size 8 should be good for the Flyknit Lunar 3. There’s more toe-box room than the LunarTempo and Pegasus. 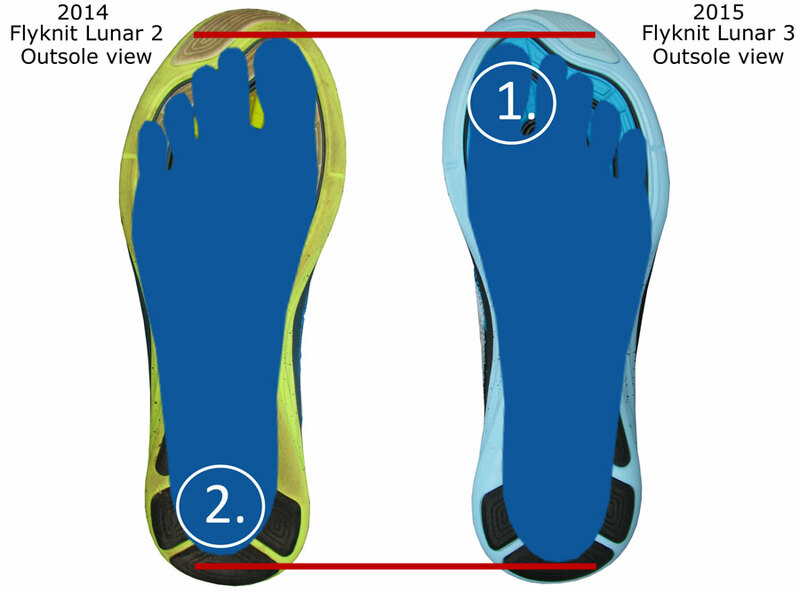 We suggested FKL3 based on your needs – light, and cushioned under the forefoot+heel. Otherwise the Pegasus is a great shoe. Thank you very much for this detailed review. It’s so much better than common reviews out there on the internet which are just repetitions of marketing words. I do have a question on the FKL3 though. 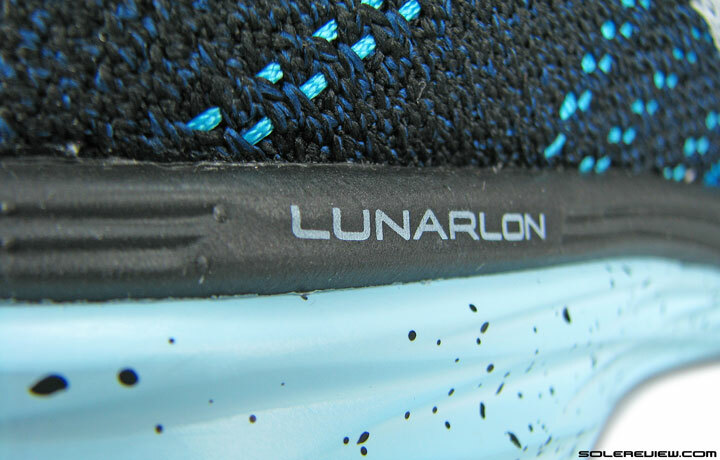 How long can this Lunarlon midsole hold its cushioning? I used to own Kobe shoes with Lunar midsoles and they lost their bouncy-ness within like two months of usage, and I wasn’t using them everyday. I’m not very sure about the FKL3’s. Can they last, let’s say, 500K’s? Thank you! Lunarlon will hold till 500 kms, though some of it will depend on your footstrike/bodyweight. A thing to note is that the insole loses its cushioning much earlier than the main midsole foam, and many a times that is mistaken for the loss in midsole cushioning. Glad to support your indigogo campaign. You guys are easily my favorite review site! My question is about durability. The last 3 pairs of shoes I’ve run in have been of the Zoom variety (Elite7/Pegasus 32,) and I have been happy with them. Especially with how long they last, I have gotten nearly a 100 more miles out of them. Stability is also a plus point. But I miss the lightness and speed of the Flyknit Lunars. Have they improved the durability of this Nike model? Hello Kevin, thank you so much for having our back! Appreciate the support and the kind words. 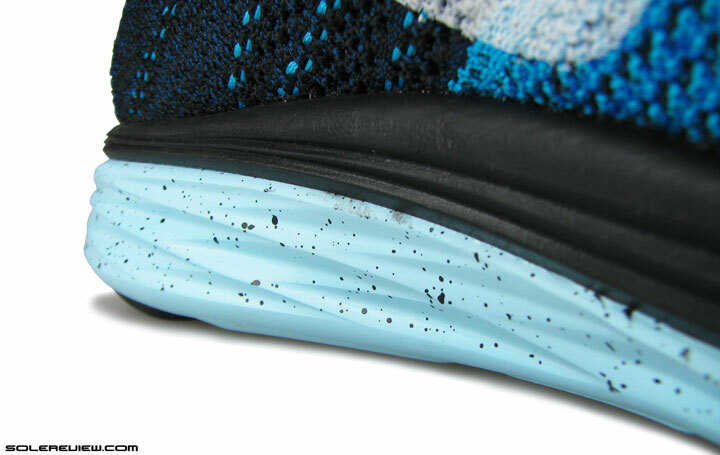 The durability does not seem to have improved in successive versions of the Flyknit Lunar (V1 – V3). The reason appears to be its specific outsole design, and using a rubber material other than what’s used on the Pegasus. Hello, I am currently using the nike free flyknit 4.0 about 2 months. I mostly doing my workout about 6 hours per week and some basketball about 1-2 hrs. I feel the stability of my NFF 4.0 are not good enough, was thinking about the Nike Flyknit Lunar 3, UA Gemini or any other shoes suitable for me? I’m 175cm 54kg. Thanks for the great review btw,very detailed. Are you running during your workouts? If not, then getting a low-cut basketball shoe or cross training shoe is a better idea. Otherwise the Speedform Gemini is very stable, much so than the Flyknit Lunar 3. I am currently training for the jumping events for track and field, and need a shoe that will support my plyometrics, weight training, and speedwork. Would the Nike Flyknit Lunar 3 work for these workouts? I have looked at the Zoom Elite 8 too, but am not sure which shoe would stand up to this training and prevent injuries (like stress fractures). 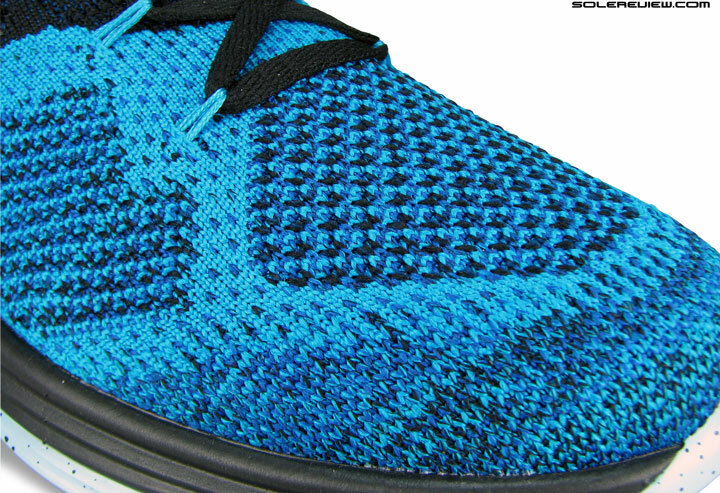 The Flyknit Lunar 3’s upper and midsole is not supportive enough for your needs. You’ll be better off in something like the Lunaracer 3 or the New Balance 1500 v1. For the past year, I’ve been running in the Flyknit Lunar 3 for everything from short runs all the way up to a marathon, and I must agree it’s a great shoe! How would you say it compares to the adidas Boston Boost? I was contemplating making the switch. What’s your take? The Boston 5 Boost is firmer riding than the Flyknit Lunar 3, and has a tighter upper. So it depends whether you’re ok with these differences. Really keen to get these but nowhere local sells them, so trying them on in person isn’t an option. Have heard they’re not best suited for those with wide feet so was wondering what your take on them was. I don’t really have much else to compare to. I own a pair of Nike Stefan Janoski Air Max (obviously not for running) and a UK size 11 fits me perfectly. The shoes I currently run in are the New Balance 750 V2, and for them I wear a UK size 11.5. Do you think a UK size 11.5 would be enough or would you recommend a different pair of Nikes? Also looking at the Free 5.0, Winflo 2 and Vomero 10. Yes, compared to some other Nike models, these run a bit slim under the forefoot. Skate shoes fit tighter than running shoes, so if you’re UK 11.5 in the New Balance, then makes sense to get the same size in the Nike. Your requirements is a wider forefoot, so the Nike Vomero 10 is a better choice over the Flyknit Lunar 3. Hi! Considering the stability features mentioned, can i (mild pronator, forefoot striker) use these shoe for short races until 10k? Yes, these should do ok.
I’m currently running in the flyknit lunar 1s. But their time has come to an end!I’m having a hard time finding any flykbit lunars in our area, and I have a 1/2 marathon coming up in about four weeks. Any recommendations? What about ordering a pair online from Nike directly? What shoes are available in your area? 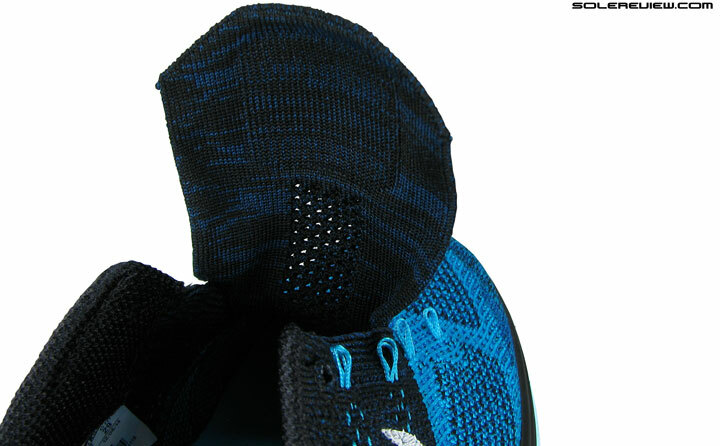 Or as ricdeau suggested (below), ordering the Flyknit Lunar 3 online is a good idea. I need some advice regarding these shoes. I’m 1,78m , 70kg and a heel-striker. I’m interested in transitioning to more of a fore-foot strike. So I’d like to know if this shoe is suitable for that (my biggest concern is the heel-to-toe drop)? Also, I’m planning to use this shoe for longer runs (let’s say marathon length).. Is this shoe good for longer runs? If you think this is not the shoe I’m looking for, have you any recomendations? I would appreciate the help since I don’t want to waste that much money only to find the shoe not fitting my needs. Is there a reason why do you want to switch to a forefoot strike, and why does a heel-to-toe drop concern you? Going fast with a forefoot strike? Not necessarily. The exception here is fast track workouts using spikes or flats, but those are high speed, short burst workouts >500 meters, not for daily training. Same for transitions too. A forefoot strike does not mean easier transitions – there are other variables involved. You know best, but based on our observations, a forefoot strike does not offer any (conclusive) benefit over a rearfoot strike. Unless you’re suffering injuries and have been recommended by a physio/coach to change. A rearfoot strike is seen as a negative only in cases where the runner overstrides, striking on the extreme heel edge. A lot of pro-marathoners win races with heel strike and 10+ mm drop shoes. That said, you can try the New Balance 1500, Nike LunarTempo/Racer 3 or adios Boost if you want to transition to forefoot strike, and also want a speedier shoe meant to cover distances. I bought Nike Pegasus 32 which wasn’t my intention at first but as I tried different shoes I became aware that, for me, Pegasus felt really light and not so firm as some other models (like Lunarglide 7). As I was afraid to go too minimal all too sudden those seemed like a nice alternative as they provide more cushioning than those minimalistic models and yet not too much (again, speaking from my experience). Anyways, thanks again for your recomendation. I’ll definitely consider shoes you mentioned when buying my next pair! What you think what is better (price quality) lunar 3 or lunarglide7. Lunarglide 7 has better price-value. I currently run in the Brooks Ghost 8, but I am looking to trim down some in weight and add some responsiveness for my 5K races, but I would like to maintain a solid amount of cushioning under foot (forefoot and heel). Do you have any recommendations? On paper, I’m looking at the Flyknit Lunar 3, Lunar Tempo and Adidas Boston Boost. Do any of those seem to fit what I’m looking for ? Any other shoes that I haven’t mentioned would be appreciated as well! Out of the three, the Nike Lunartempo looks to be most suited for your needs. We’ll also suggest the New Balance 1500 V1 or V2. Thank you for the recommendations! As I was checking out the New Balance 1500 versions, I noticed they are stability shoes. Would the stability be mild as I am a neutral runner? Or might the Lunar Tempo still be the most appropriate during to being neutral? Don’t worry about the 1500’s categorization – they’ll do just fine. Any which way, the whole neutral vs stability vs pronation concept is gross over-rated. You can get the LunarTempo if you need more cushioning than the 1500.
can you compare the ride to that of the lunar glide 7? thanks! The Flyknit Lunar 3 is softer in the heel and forefoot than the LG7.